Network Design & Setup - Inner Net Inc.
Network design and setup is not always thought of as something important. However, in todays networks that combine computers, phones, cameras, Wi-Fi access points, and remote access, Network design is even more important. With the correct design it is possible to isolate all these systems to separate networks all running on the same cable infrastructure for added security. 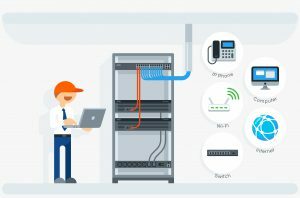 Inner-Net has 25 years of experience and has advanced network engineers who have the knowledge to setup complex V-LANS using world class network switches from Cisco that makes this all possible. Network design is the basis for any solid network setup and long-term growth of the network over time. As devices are added to the network latency does not suffer with the correct design, network traffic moves smoothly across the various V-LANS without any developing issues to come.